CAN YOU SPEAK “DOG”? « THE BRYCE IS RIGHT! – Who is better trained, the pet or the master? Recently I discovered “Sergeant Preston of the Yukon” in the wee hours of the morning on one of the retro television stations. This was a favorite of mine back in the 50’s which I watched with my father on CBS, one of the few shows shot in color at the time. It was the story of an RCMP Mountie patrolling the Yukon territory back during the days of the Gold Rush. My father loved the outdoor settings. 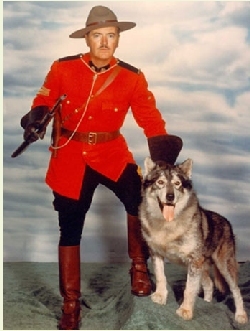 As for me, I adored the sergeant’s dog, “Yukon King,” a brilliant animal who served as Preston’s partner. As a little kid, I was amazed how well the dog could understand his master’s commands. Preston would say “guard” and King wouldn’t allow the prisoners to move. Better yet, the sergeant would say, “King, you go around to the back of the cabin and come in the back window,” and by God the dog would do exactly as instructed, capturing the bad guys in the process. The dog appeared to be so smart, you wouldn’t want to play him in a game of chess. I naturally assumed all dogs were as smart as King. Boy was I wrong. Over the years, my family has owned a Cocker Spaniel, two German Shepherds, a Boston Bull Terrier, and a couple of miniature Dachshunds. They were all nice dogs, but they certainly weren’t intellectuals. At most, the dogs only knew seven commands: “sit,” “speak,” “cookie” (a favorite of theirs), “out” (meaning, “Do you want to go out?”), “heel” (when walking them on a leash), “shake” (to extend their paw), and “no” (which only works depending on the strength of your voice). Other than that, forget it. They weren’t stupid animals, but unlike Yukon King I think I could easily lick them in a game of checkers. Actually, I think dogs have their owners better trained than the other way around. They let us know when strangers are around, when they want to go out, and particularly when they are hungry. Owners promptly act on the dog’s command. Maybe it was Yukon King who devised this sophisticated plot to turn the tables on the owners. Think about it, whenever you give a command other than the typical seven listed above, they know what you are saying but give you a blank stare of befuddlement instead. NEXT UP: MICROSOFT: WHERE DO I SEND THE BILL? – Losing time as a result of Microsoft updates. LAST TIME: GETTING THE POLITICAL FINGER – What to do with liberal antagonists. This entry was posted on August 5, 2016 at 7:00 am	and is filed under Life. Tagged: dogs, Florida, palm harbor, The Bryce is Right, tim bryce. You can follow any responses to this entry through the RSS 2.0 feed. You can leave a response, or trackback from your own site.